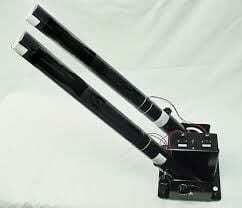 Our confetti cannon rental comes with a 25 foot remote and power cable. A confetti cartridge must be purchased from Just 4 Fun Party Rentals for use with the machine. Consequently the cartridge size can range from a small blast for a stage or a large blast for an audience or ballroom. The standard confetti cartridge contains multi-colored streamers and confetti mixed. We also offer custom fill options with confetti, streamers, or both and in a variety of colors. Confetti cannons are best for 15 ft+ ceiling height and outdoor venue. Therefore placement of the unit should be at least 10 feet from the blast and at a angle that will allow an overhead blast. Finally the confetti can be easily cleaned up with a vacuum or commercial shop vacuum. *You will need to consult with your venue for coverage area we are not responsible for full coverage of an unknown area, click here for info. Large ballrooms may require 4+ units for good coverage. Click here to rent a portable stage or dance floor.